The Razor E300 Electric Scooter is a 14+ electric scooter for adults. It features a super-sized deck and frame for large feet, a high torque motor that speeds up to 15 mph and weighs 21 kg making it the perfect electric scooter. Opening the box, you will get one scooter which you must put together. You should expect to install wheels handlebars and so on. The box is also quite heavy so if you don’t work out, you might need a little bit of help with it. 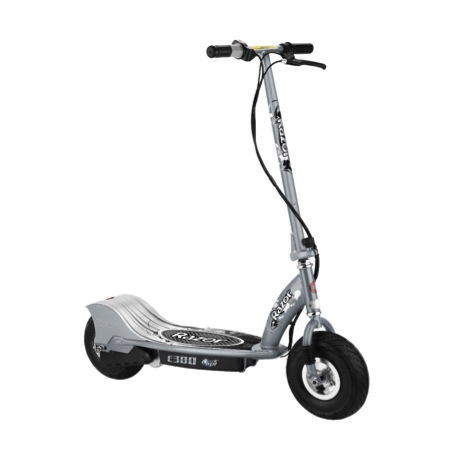 The Razor E300 Scooter is battery powered and supports up to 40 minutes of continuous use. The scooter features a 250 watt engine that can reach speeds of 15mph and features direct start grip throttles, hand operated brake for extra control, folding handlebar for easier storage, 25cm Pneumatic Tyres, Retractable kickstand and supports up to 100kg of weight. The Razor’s first advantage is that it’s very quiet. You can zip up and down your street at midnight doing speeds of 15mph and not have to worry about waking anyone up. It’s also quite sturdy. Weighing in at 21 Kilo it’s about the weight of a small child and is quite durable; you probably don’t have to worry about breaking it under normal use. The rechargeable battery delivers up to 40 minutes of continuous use on flat ground (less with hills taken into consideration) and can go quite fast at 15 mph which is a great deal faster than many other scooters of its calibre. The speed acceleration and throttle grips are extremely convenient and easy to learn, you can be up and driving around on this one like a pro just a few minutes after reading the owners-manual. The deck is also very large which makes it a perfect scooter for adults. The E300 Razor weighs 21 Kilograms. While the handlebar does fold away so that you can store it more easily, it’s just too big and too well built to be easy to fold away and store in a small space. While it is advertised as being able to go in small places, it’s easier to give it its own space in a garage or etc. The battery life also only lasts for 40 minutes. You can’t use this one to go to town unless you also have a spare battery or two (for hills). Unfortunately, you need a screwdriver to change the battery which can make that slightly difficult. The E300 Razor scooter is an all-around good buy and will perform well for pretty much any adults who need an electric scooter. 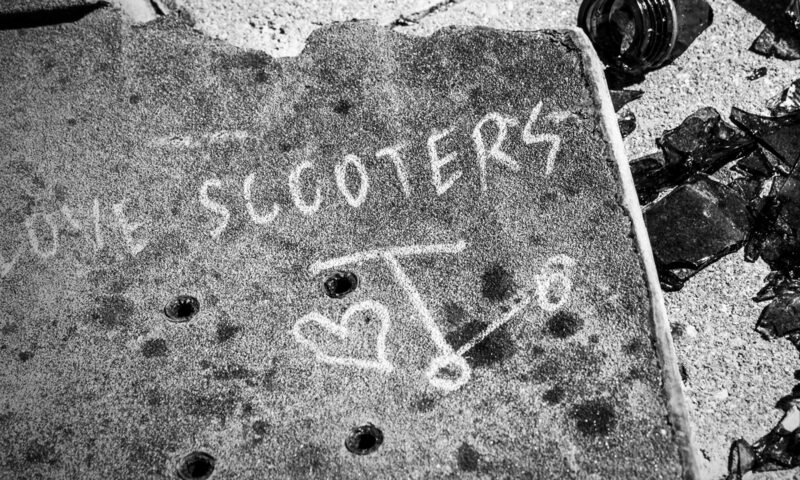 However; the scooter is much too heavy and a great deal too fast for children and should not be purchased for them. It is intended for adults weighing 60-100 kilo. The scooter costs £219.00 which is an average price for this type of electric powered scooter. It’s available in a variety of colours. I have a neighbour that has purchased a Razor E300 electric scooter, he rides this scooter on the pavement, sometimes he carries a 5 year child on it at the same time. Surely this is illegal. I contacted the police to find out what the situation was, but they say that they are not sure where the law stands. How come nobody can help me. Hi Audrey, what help do you need with this? I can help you Audrey. I can book you an appointment at my psychiatric surgery anytime this month.